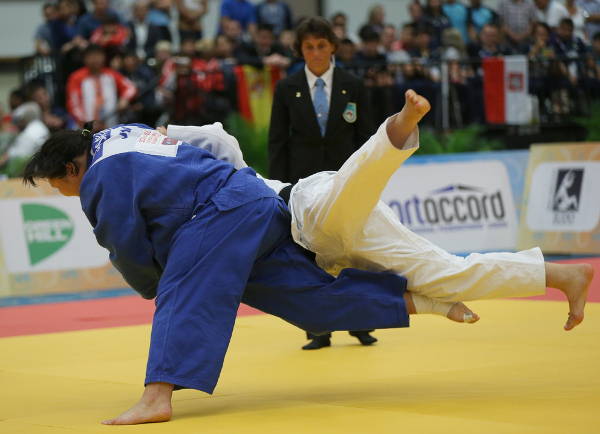 The Junior World Championships, Fort Lauderdale 2014, continued with a spectacular day of judo on the last day of the individual competition on Saturday. 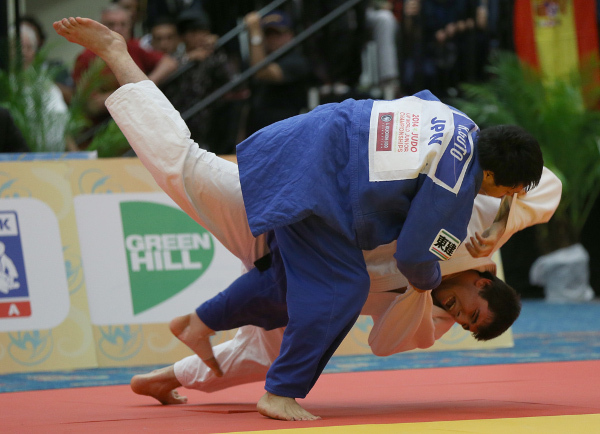 Four weight categories were in action as the junior women’s -78kg, +78kg categories and the men’s -100kg and +100kg categories all graced the tatami. 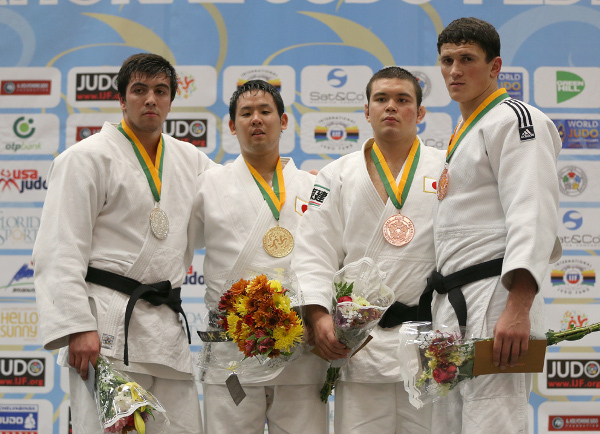 The world’s leading young heavyweights illustrated their quality at the last IJF World Championships of the year. The Junior World Championships will come to a close on Sunday with the pulse-pounding team competition. Judo fans will see 18 teams compete in the men’s event and 16 teams compete in the women’s event. Mr. Daniel LASCAU, IJF Sports Director, conducted the draw ahead of the final block on day four in Fort Lauderdale. Reigning junior men world champions Georgia were drawn against Uzbekistan while junior women title holders Japan will start the defence of their crown against Great Britain. 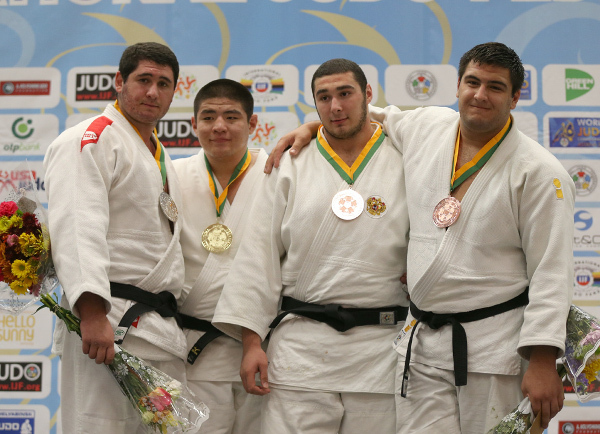 BUKHBAT Mashbat, Mongolan Judo Association General Secretary, was satisfied with the team draw but believes anything can happen in the hugely exciting format which made its Youth Olympic Games debut at Nanjing 2014. Japan finished top of the individual medal table with seven gold medals, four silver and two bronze ahead of France (one gold, two silver, five bronze) and Russia (one gold, two silver, three bronze). 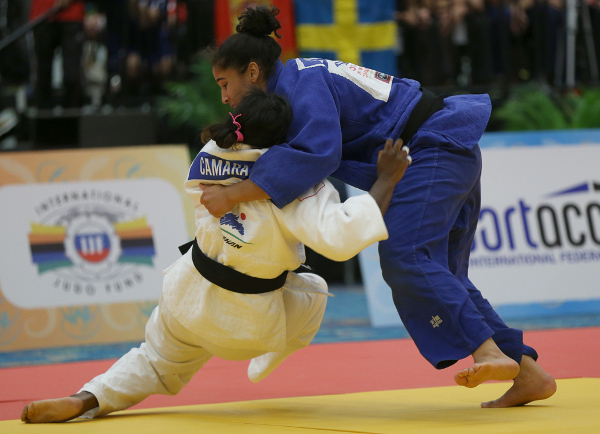 African Championships bronze medallist Sarra MZOUGUI (TUN) became Junior world champion as she defeated Junior European bronze medallist Sama Hawa CAMARA (FRA) in the first final of the day on Saturday. Both judoka were active and ambitious which made for an exciting contest. After two minutes the Tunisian fighter was penalised with a shido for going out of the area. The 20-year-old MZOUGUI launched a ko-soto-gake which earned waza-ari and advanced into osaekomi to hold down her French opponent for 15 seconds. The Tunsian fighter said: "I am very happy. I worked really good with my federation, my coach Slah Rekik. The fight which wasn't very easy was the fight with the Polish fighter because she was moving and running very much on the mat. I train three times a day with boys and girls. I am working on physical and technical preparation and I want to thank the IJF because they invited me here and I would also like to thank the Tunisian Federation." In the first semi-final CAMARA dismissed 18-year-old Paks Junior European Cup silver medallist Anna Maria WAGNER (GER) by two yuko scores after starting the contest by receiving two shido peanlties for passivity. In the second semi-final MZOUGUI bested Evelin SALANKI (HUN) who finished seventh at the Junior European Championships. The Tunisian won three of her four contests by ippon including the semi-final after just 43 seconds. 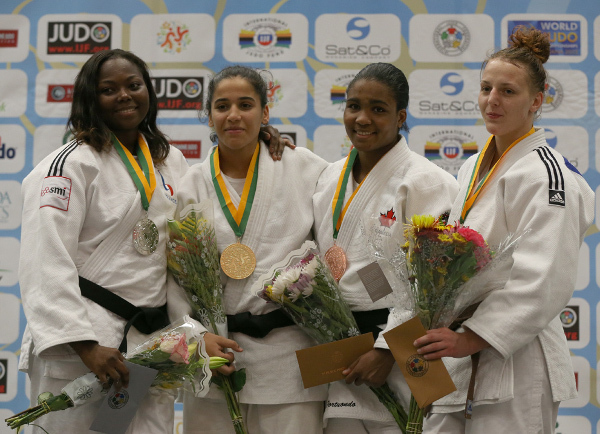 The first bronze medal was won by 18-year-old Commonwealth Games bronze medallist Ana Laura PORTUONDO ISASI (CAN) who convincingly defeated SALANKI. All three victories for the Canadian were by ippon as she sealed a spot on the podium in front of Judo Canada President Mike TAMURA. The second bronze medal went to 18-year-old Junior European silver medallist Beata PACUT (POL) who saw off WAGNER. PACUT registered the only score of the contest after 67 seconds with a tani-otoshi before being penalised once for passivity and twice for false attacks. In the first semi-final Junior Asian Championships bronze medallist HAN Mi Jin (KOR) fell to SAPSAI (UKR) by ippon after trailing to a yuko. In the second semi-final ASAHINA absorbed every attack Junior European bronze medallist Marine ERB (FRA) could muster to win on shido penalties. ERB was penalised twice for gripping infringements and once for passivity while ASAHINA was only penalised once for passivity in the scoreless contest. 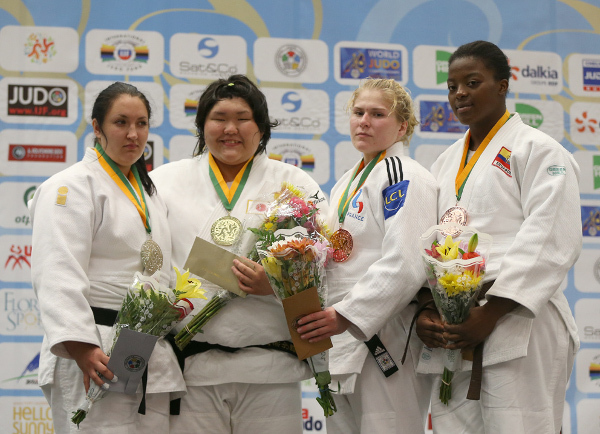 The first bronze medal was captured by ERB who held down Junior European Team gold medallist Ivana SUTALO (CRO) while the second bronze medal was destined for Ecuador as Junior Pan American gold medallist Marlin VIVEROS (ECU) entered her name into the record books. The impressive 19-year-old won her country’s first ever world medal at any level by ippon after 65 seconds. Junior All Japan Championships silver medallist GOTO Ryutaro (JPN) became Junior World Champion in the -100kg category in front of Japanese Head Coach and -100kg legend INOUE Kosei. GOTO defeated Junior European champion and top seed Niyaz ILYASOV (RUS) to suggest that he could be a contender to fill the senior void for Japan in this weight category. GOTO received a shido for going out of the area but went a waza-ari up after two minutes which was enough as the best ILYASOV could conjure up was a yuko score. INOUE Kosei, who was sat next to IJF President Mr. Marius VIZER in the crowd, nodded with approval during the contest as GOTO looked sharp and full of industry. In the first semi-final ILYASOV (RUS) triumphed against teammate and Junior European silver medallist Ramazan MALSUIGENOV (RUS). ILYASOV was penalised for passivity but that was never a considerable factor in the contest as he opened the scoring with a waza-ari and wrapped up the victory with a ko-soto-gake to win by wazari-awasette-ippon. In the second semi-final GOTO bested Junior European bronze medallist Zlatko KUMRIC (CRO) by a waza-ari which came with just four seconds left on the clock as the contest looked set for golden score with both judoka receiving two shido penalties. The first bronze medal was won by All Japan Junior Championships winner WOLF Aaron (JPN) who defeated losing semi-finalist KUMRIC. WOLF led with a waza-ari from a ko-soto-gake after only 35 seconds and went on to score a second and match-winning waza-ari by holding down KUMRIC for 15 seconds. The second bronze medal was clinched by MALSUIGENOV who beat former Cadet world champion Guram TUSHISHVILI (GEO). MALSUIGENOV built a considerable lead as he scored a yuko and waza-ari but the Georgian fought back to score a waza-ari of his own with a drop seoi-nage. With two minutes gone the Russian secured his place on the podium by ippon. Asian Games silver medallist ULZIIBAYAR Duurenbayar (MGL) showed the progress he has made over the last year as he went one better than he did at the 2013 Junior World Championships to win heavyweight gold on Saturday. ULZIIBAYAR, 20, was an immovable force as not one of his five opponents could score against him. 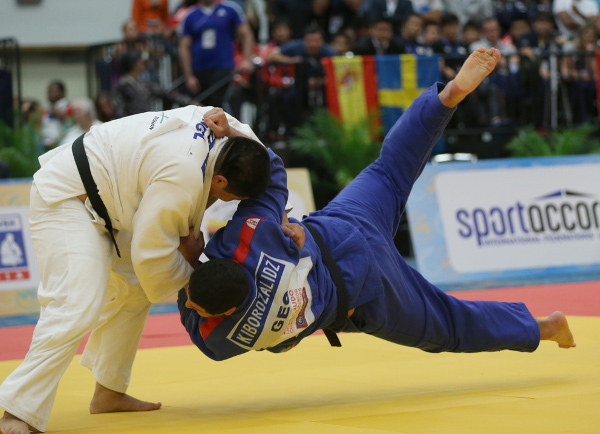 Guga KIBORDZALIDZE (GEO), who finished fifth at the Junior European Championships this year, was diaptched by ippon in the +100kg final to send the Mongolian team wild in the stands. KIBORDZALIDZE tried osoto-gari but the Mongolian took his leg away to drive him down for ippon. After celebrating with his teammates following the awarding ceremony, ULZIIBAYAR said: “I’ve managed to win today because I’ve worked hard over the last year to improve my ability. I’ve also worked with a psychologist to make sure my mind is focused on every fight and everything went well today. In the first semi-final top seed Iakiv KHAMMO was surpassed by ULZIIBAYAR. The Mongolian was penalised with a shido for going out of the area before scoring a yuko with a modified kata-guruma. KHAMMO attacked with a sumi-gaeshi and ULZIIBAYAR pressed forward with a drop seoi-nage but there were no further scores. In the second semi-final KIBORDZALIDZE (GEO) defeated Prague Junior European Cup winner Anton RUDNYK (UKR). RUDNYK broke the deadlock with a waza-ari score from an ura-nage but KIBORDZALIDZE replied with a waza-ari of his own and added a second by trapping his opponent in osaekomi for 15 seconds. The first bronze medal was won by Junior European silver medallist Ruslan SHAKHBAZOV (RUS) who denied RUDNYK a place on the podium by scoring ippon after three minutes. The second bronze medal was clinched by KHAMMO who saw off Prague Junior European Cup bronze medallist Sebastian FAGERHILL (SWE) by a waza-ari and a yuko.